Fat cats may be cute. We all love Garfield the fat cat, however, if a cat is too overweight, it may result in health problems such as diabetes. Oftentimes, a cat may be so fat that it won't participate in the usual fun cat activities. There are many reasons an indoor cat may be overweight. Keeping a cat strictly indoors often does not help with this issue, as there is less room to run and play around in and fewer things to stimulate and interest the cat. You also may be feeding your cat inappropriate foods that are not nutritious, or there may be a medical condition contributing to the obesity; obesity-related medical conditions are rare and are usually not the problem. The first thing to do would be to go to your vet and have your cat checked out to make sure he or she doesn't have any serious blood problems or other issues related to or caused by obesity. Please don't starve your cat. What you should do is stop free-feeding your cat, which means you shouldn't fill the dish every time your cat eats. Average cats should eat 20 to 30 calories per pound per day, but if your cat is overweight, feed him or her 20 to 30 calories times the number of pounds you want your cat to weigh. If your cat weighs 25 pounds but you want your cat to weigh 15 pounds, you can start feeding him or her 300 to 450 calories a day, preferably 300 or so. Try to plan out how you will divide the calories and how often to feed your cat. Make sure your cat is getting enough water. Never leave the water dish empty, and clean it and refill it regularly. Cats are finicky and don't like drinking out of dirty water dishes. Stop feeding your cat dry food. It seldom provides the balanced nutrition cats need and is full of carbs and sugar. The grains serve as allergens and can upset a cat's stomach. Cats are carnivores and need meat proteins. Also, cats are biologically designed to get water from their food, and there is obviously little in dry food. And don't worry about vegetables; cats don't need them. Start feeding your cat diet food. Ask your vet which kind to get, as it depends on the breed and how much weight your cat should lose. Try to stick with natural brands, like Nature's Variety. You can try supplements, although weight loss should be able to occur without them. L-Carnitine is an example. Play with your cat more. Stimulate some activity and movement. They love laser pointers, but try a variety of toys; each cat has different preferences. Don't be discouraged if the weight is not going down right away. Cats usually lose less than a pound a month or else health problems may occur. I have a 12-year-old cat. What are some brands of wet canned cat food to help it lose weight? 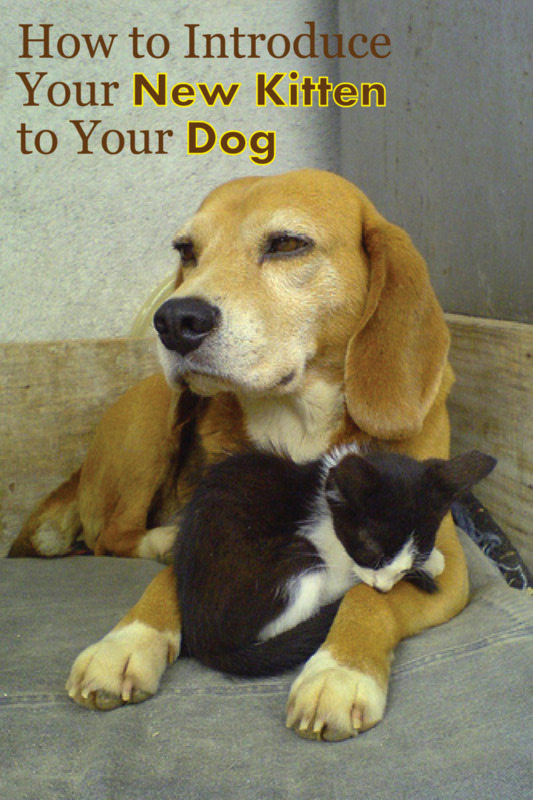 It's best to check with your vet as there are many effective prescription brands that are effective. I've found Hills Science Diet to be helpful for my cat. 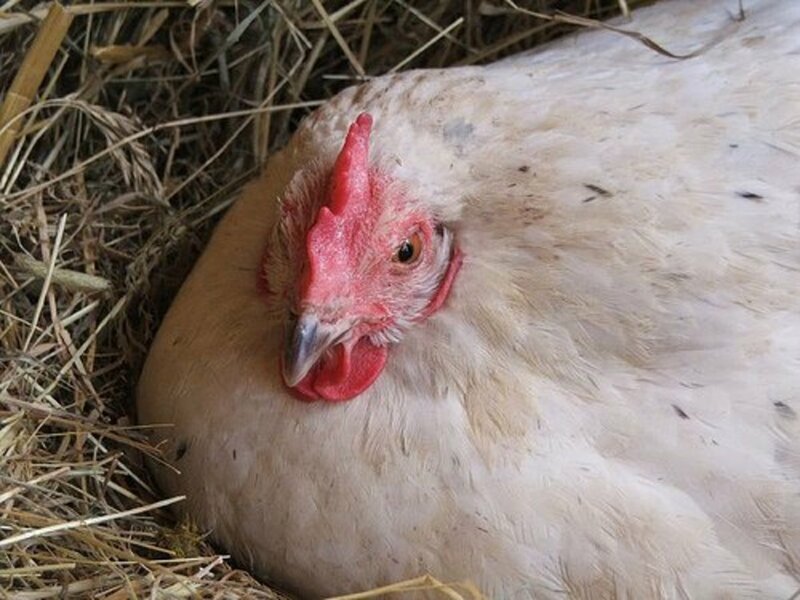 How Can I Tell If My Chickens Are Too Fat or Thin? What if you have two cats and one is the appropriate weight and the other is fat? One of my cats is a chub-bucket and I do need to help him lose weight. I voted up this hub ! My mom tried leash walking a cat once. It was more like a drag. Really, dragging the cat. You might consider putting out all his food, measured either once or twice a day. When it is gone, it is gone. Don't feed him any more. He will be angry, but he will not suffer as he has so much fat to burn for energy. As long as you are feeding him the correct amount of calories to sustain him. Check with his vet. This will take a change in your behavior. Don't feed him four times a day, don't give him a handful. Find out how much to feed him and measure it out. Give half to him two times a day. Because he gets all his food from you, you are his enabler. You have to do what's best for your cat and if that means tough love, well then do it. We became concerned when our cat weighed in at 29 pounds last fall. He was a beautiful white stray that joined our family three years ago. I cannot understand how anyone would drop off a cat as beautiful as our Pummie, but they did. At the time he probably weighed around 15 to 16 lbs. He had a habit of roaming and not coming home for a couple of days at a time. Two years ago when he didn't come home for three days, I found him with a broken back leg. We were horrified and sad and came to the conclusion that he just couldn't be an outdoor cat any longer. Since then, his weight has soared. I took him to the vet last fall and he was extremely concerned about his weight and we discussed the potential of diabetes along with other life-shortening possibilities. He told me to reduce his food significantly and to stick with dry food, not wet. We feed our cats Purina Naturals which contains 38% crude protein, 13% crude fat, 5% crude fiber and 12% moisture. I try to feed him only three or four times a day - morning, sometimes noon, dinner and just before bedtime. I only give him a handful each time. It appears he may have lost about 4 lbs. since last fall. I have concerns of his little weight loss. I find it interesting that the recommendation is to go to canned food, as it is the opposite of what my vet told me to do. However, the carbs argument makes lots of sense to me. I'm going to try to make the switch to canned food. I have in my hand Paul Newman's Own Chicken and Rice formula which contains 9% crude protein, 6% crude fat, 1% crude fiber and 78% moisture. It seems to contain no wheat gluten. Does this sound like a healthy food for our cat and one that will help him lose weight? Could someone advise me the best way to make the change to this food from the dry? Finally, he is inactive now that he is inside. I will try the pointer trick. Do any of you use a leash to walk your cat and have you had any success? I would like to suggest that you put your food on the other side of a barrier that only a thin cat can get through. This will keep your chubby kitty from getting to food until she is small enough to be eating it. It also takes you out of the role of enabler. Plus, it will be hysterically funny to see her try to squoosh herself through that tiny hole! My cat has a very big bone structure (he's taller and longer that most cats) and it doesn't help the fact that he's also chubby, so I wouldn't know what a healthy weight would be for him, he 34 pounds,and where moral size cat look like kittens compared next to him. So what would be a normal weight for a cat the size of a Linx/ bobcat? What worked for Shadow was getting her on an all-natural reduced-calorie Ultra cat food and following the feeding directions on the bag. There isn’t any crap in this product (no corn, soy, wheat) and so my cat got everything she needed and nothing she didn’t. She liked the Natural Balance best – as we tried a few. I also played with her more (she likes me to throw those fuzzy mice) and a month later she was less fat and actually in a better mood, LOL. I have an obese cat and whilst I try to monitor his diet, it is very difficult to get him to exercise. He's indoors a lot of the time and goes out for an average of 1-2 hours a day. Even then he just sits outside and watches the world go by without moving. I have tried numerous toys where he chases them for a full minute and then just sits down and watches them, sticking out his paw every now and then. This is not exercise! The laser lights and remote control toys don't work either. NOTHING works! Thank you all for your comments and for sharing your input. I know a lot of people can have different opinions on these things. My mother works for a veterinarian, so a lot of what I believe is from what she tells me and what she sees at the vet. Thank you for stopping by! The article was written with the exact best advice. Feeding a cat, even one that's not overweight dry food is the worst thing you could do for your cat. Cat's are obligate carnivores. They need meat. Dry food contains way to much grains and carbs.Cats should only be fed a diet of canned food. A cats digestive tract doesn't process grains correctly. Feeding dry food leads to illness, disease and obesity in most cats. Also free feeding is a no no. Feeding a cat dry food is like feeding a child Froot Loops 24 hours a day 7 days a week. It's not good for them. Dry food is full of sugars and terrible things for a cat. Please go to catinfo.org if you truly care about your cat and want your cat to live a very long disease free life. It'll save you a ton in vet bills, I promise. On the isse of dry food suppodedly being good for a cats teeth. That's a crock. Is feeding your child crunchy cookies good for their teeth? I think not. 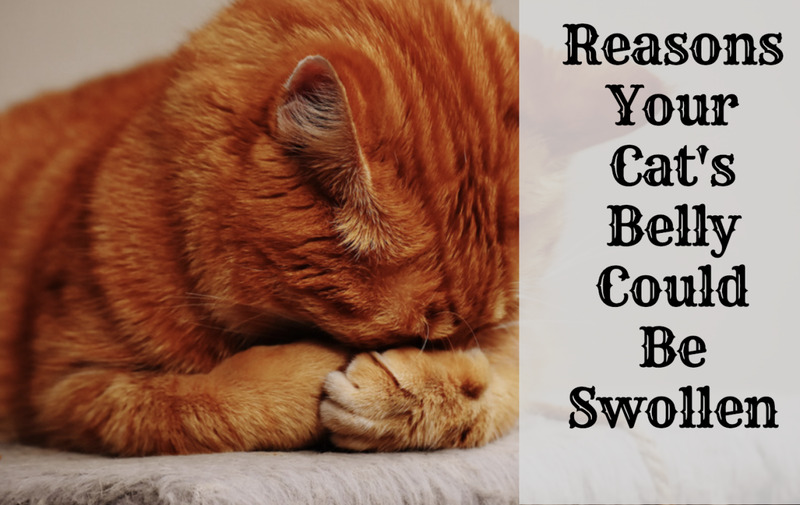 Dry cat food is full of sugars. Do you know the pet food companies need to spray their dry food with a coating of animal digest just to get them to like it? The reason being is that dry food is so far removed from what a cat truly needs nutritionally the pet food companies need to trick cats into eating it. I swear this info I'm giving you is true. Just look it up on the internet. Even vets are trained about cat nutrition from the big pet food companies. They do not have your cats health in mind, only profits. Morning All. My Cat is prety big she wants too eat all the time I say no but she grabbed the contaners that her food is in what can I do also I feed her at night as a baby help me please. when buying wet food, buy wet food that has 10% crude protein, to best help your cat with its hunger pains and to feel fuller longer....when buying dry food pick something with at least 30% crude protein.....also note that corn is a common allergy among cats but sadly almost all dry food is made with corn.....if you notice your cat itching then you will need to change his/her food because they will itch themselves until they are bleeding and they will still scratch more. If that cat had alittle moustache it could be my cat Tigger :), currently have her and her sister on a diet and neither one is happy about it. Okay this is the healthiest way to get your cat to lost weight. The lady that wrote this article has no idea because if you drop cat food like that then you may give your cat fatty liver disease. What you should do is figure out how much your cat weighs. Then you look online for a cat food index. I have one so ask me and I can email it to you. It has calories per cup next to any name brand you could buy pretty much. Anyways, once you figure out your cat's weight. Then there is an equation you must follow to keep your cat on a healthy diet. I will use a 15 pound cat as an example. EX. 15 x 30 calories per pound = 450. Now that is how much you should feed him if you wish for him or her to stay 15 pounds but to start your cat on a diet you must decrease the intake of food by 5-10% otherwise you are liable to make your cat sick and give him/her fatty liver which can be fatal if it is untreated. Back to the example 15lbs x 30 calories per pound = 450 calories per day now subtract 45 calories from your cats daily intake (which is 10% if you aren'y sure)which would be 405 calories per day. No less or he could get sick, and it leaves room for some num num cat treats. The best thing for your cat is giving them raw meat because before you cook it, it has extremely high amount of proteins and over half are taken away after you cook it. Also, can food is better than dry food but do your homework because often times some products in wet cat food make cats anxious and make you think they are hungry when they really just need some TLC. Wet food can also be bad for cats because some companies go to veteranary clinics and pay the clinics for the dog, cat, etc. dead body and often times they leave any flea collars on and they used animals that have already started rotting. SO PLEASE FOR YOUR CATS SAKE DO YOUR HOMEWORK. I DID AND WITH LITTLE TO NO MONEY IN MY POCKET I CANNOT PAY FOR THE BEST BUT I TRY TO GET THE CHEAPEST BEST. Weight problems seem to be a common problem for cats, but putting my two cats on a grain free diet really helped to slim them down. Plus they also seem much more healthy and energetic. I've also been told that dry food is in fact bad for their teeth, after all cats were made to eat prey not high carbohydrate dry cat food. I used to live in the middle of the woods where my cats could pretend to live like their ancestors. but now I live in a neighborhood house with nothing to hunt or woods. At least my cats have each other. My cat has diabetes because he is overweight. Thank you all for your comments! 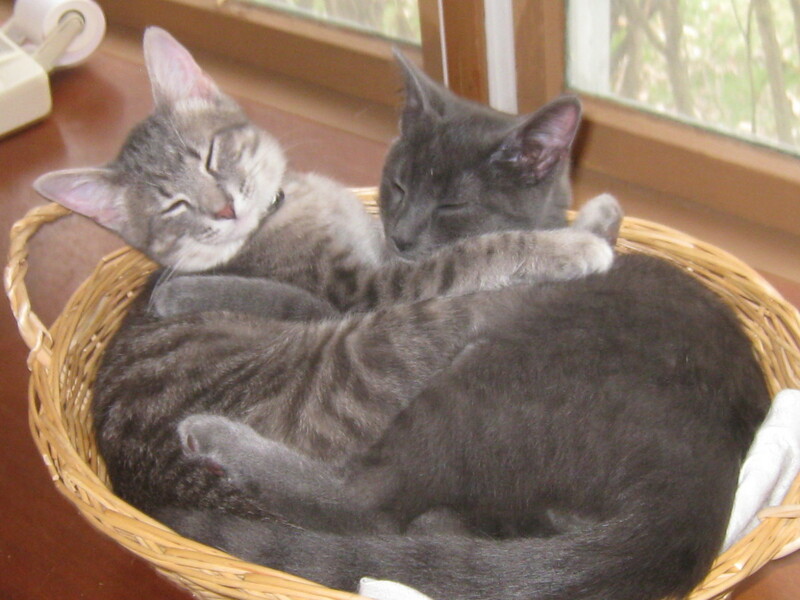 Giz and Xan, thanks for sharing! I should mention that by saying "we never realized" I mean we never realized he was as overweight as the vet made him seem. He always could climb stairs but chose not to but now he will come down the basement with me :) it's amazing what a change in diet and eating habits can do!! Then the instincts start to take over and they begin to exercise more. We never realized our xan was overweight because of how fluffy he is and he is fairly bigboned but we noticed matting and dander so we took him to the vet for his vaccines and asked about it. The vet showed great concern of his weight (a hefty 23 lbs) so we switched him off science diet because of the corn in it. Just watching him eat twice a day (wet and dry)and picking up his food right after has helped. We now have him on Blue Menu and it seems to fill him up faster (which helps with the price of the food because it lasts longer) :) he still can't jump to the top level of the cat tree but at least he climbs stairs now and can play for longer than ten minutes! Fantastic hub, looking forward to come back and be fascinted by your posts. Thank you. I feed the slim one in the bathroom with the door closed, and then go feed fat cat in the kitchen. As soon as fat cat is done I let the slim one out of the bathroom and put his leftovers in a bathroom cupboard and will let him snack on it later out of sight from Cicero the fatty. Fatty rarely has leftovers from a meal, but if he does, I put his up and away too and later give him the remainder as a snack as well. They love to tackle each other and play, but I should be playing with them more. Cicero used to love the laser pointer so I think I'll invest in another one. Pia, thank you for sharing your experience! We have had a lot of success in moving the cat's food, litter box and cushion to 3 parts of the house. From being a 13 lb cat, she's now a relatively svelte 11 lbs :) Thanks for this Hub. I'll try to get her on diet cat food as well. My niece has a fat cat and he neighbor told her to invest in a cat tree, also referred to condo, furniture, etc. She said once the cat got use to the tree, she runs, jumps, pounces all over it. She is seeing a definite difference in the cats weight. Indoor cats that are fixed can really gain some weight. Our vet has a cat that looks like it could whip our boxer lol. 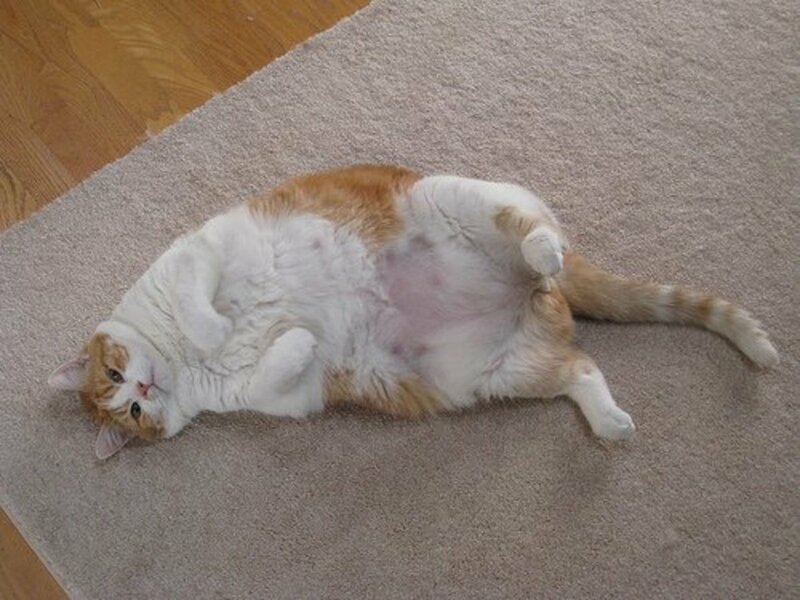 Fat cats are adorable but we want them to be healthy. Thanks for the information. I am an animal lover and I have always wanted a cat but my family is allergic so we have grown up with dogs. My dog is a little overweight. I think that some of these tips can help him out. Thanks for the Hub. Thank you all for your comments and for reading this Hub! I am also shocked sometimes by how large cats can get! Kate, thanks for the tips. Sometimes people think that cats are so independent that they forget that they may need prodding to get some exercise and that they may need to be played with. wow this picture is so shocking. it amazes me how anyone could let there cat get this big. His quality of life must be affected. I advise visitors to my site that one of the best ways to help over weight cats is to establish a feeding routine and also an exercise plan. this can consist of just getting your cat to run around for a few minutes every day at first chasing balls etc. 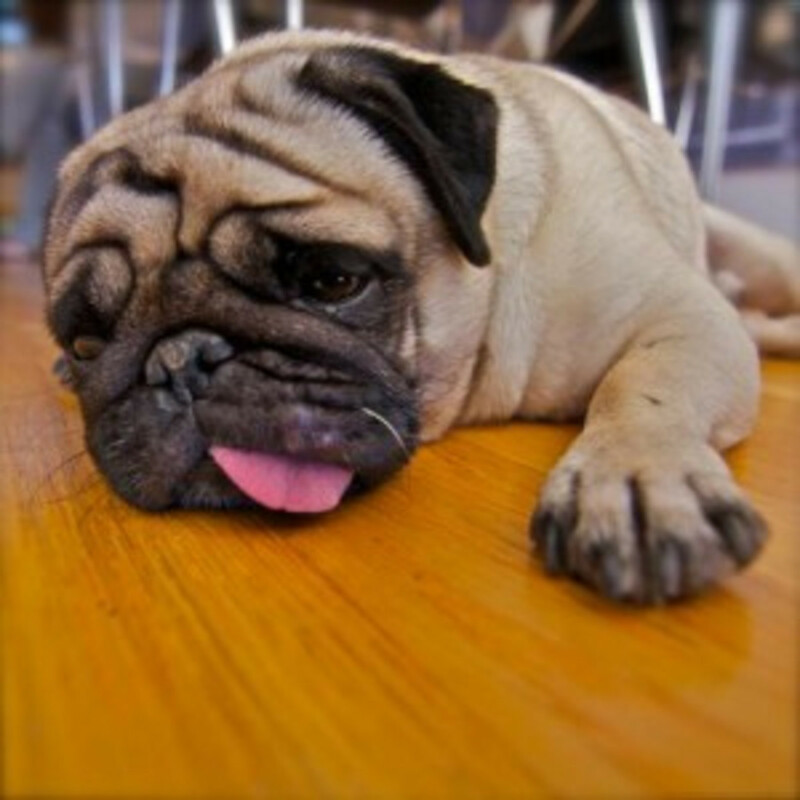 Often excess weight is due to lack of exercise and too many treats. Great information which is well shared. Very informative! I had no idea dry food is not sufficient for hydration. Could it be that cats overeat the dry stuff because they feel unsatisfied? I will start feeding my indoor cat some wet food as well. Thanks for this information. Trying to find some sort of diet for my cats is always a pain and they never like it! I will have to try this information and see if I can get results. For anyone out there, cat trees are another great way for cats to keep in shape. To check some out visit: http://squidoo.com/cattreesthatlooklikereatrees -- That could help as well! I went to the vets with my 2 cats and they told me they were 'slightly over weight' (they were being polite). One of the Cats refuses to go outside whilst the other loves to roam. The vet suggested that we put dry food into bags that have been measured out and only use that. That way we avoid over feeding them. Also be warned that cats will try to fool you. Many times I have been fooled into feed the cats twice as my partner had already feed them. Your cats will not starve as long as you stick to a routine. It is worse for them to be uncomfortably overweight. one of my cats was overweight. we started feeding her grain-free, gluten-free dry food and it made all the difference in the world. it's definitely worth the investment. Exercise and diet cat food definitely help. I also agree that drinking more water is very helpful but some cats do not like to drink that much. Stagnant water is a real turn off. So look into buting one of those water fountains that circulates the water through a filter. 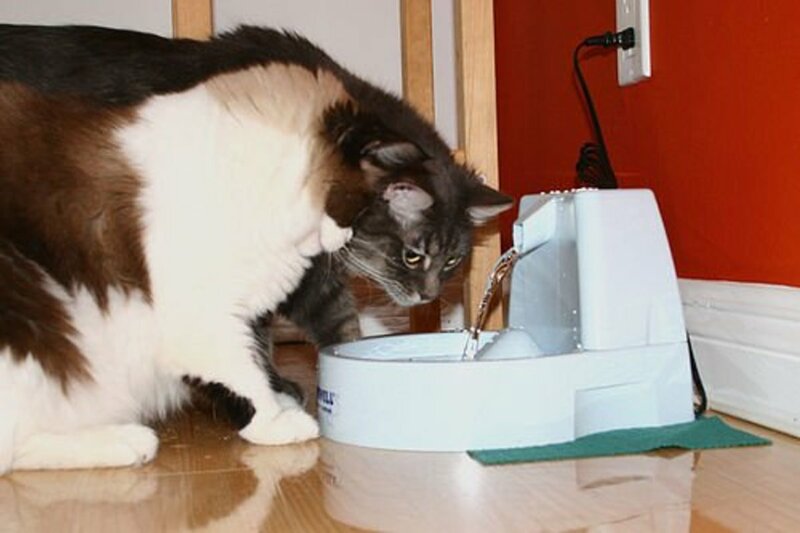 cats are facinated by anything that movs including water. it's why they always jump up to the sink. Also add icecubes to keep it cold. Thank you all for yor comments. Amymarie, I have heard that cats should not have too much wet food because it can indeed be bad for their teeth. I give my cats mostly dry food with some wet food on top for a treat. hope it works for my "garfield"
I've heard that dry food is good because it keeps a cats teeth from rotting. Is that really true? In answer to one response "do fat cats live happier lives"
the answer is they live shorter lives...just like obese humans. reminds me of my cat. She isn't quite this big, but she likes her food. I'm happy to have found this hub. My cat is too fat and he doesn't care to play anymore. I will try taking him off dry foot. He's going to be really mad at me if I control his meal times!!! These are some great tips. It's difficult keeping one of my cats weight down because she always eats the others food! One pattern I've noticed in pet owners with overweight kitties. When owners try to not bother with feeding them constantly and just keeping huge stockpiles of cat food available in large bowls or containers. 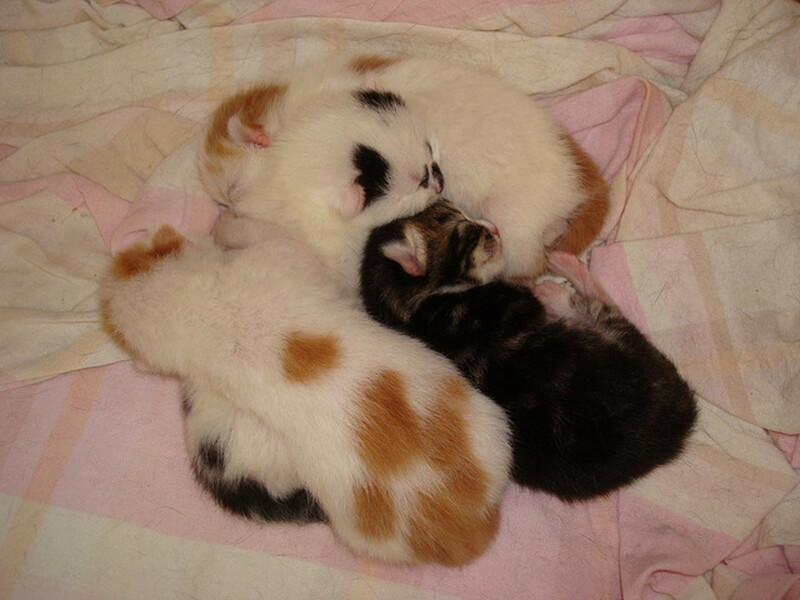 The same pet owners also seem to do little to stimulate a lot of interest for the kitties as well. We're guilty of that. But the cats grow up just fine even fairly overweight. But I admit, none were nearly as fat as the grey blob lazily napping at the top of the hub. My cat is an indoor cat and he is very active right now. As he gets older, his activity level will probably decrease. Great job encouraging your cat to exercise! My kitty started getting fat and I was alarmed. Actually, I was very worried about her getting feline diabetes, so I was proactive. She loves playing with a laser, in fact, she's pretty much addicted to the thing. She will chase it up and down the stairs, too. She's lost quite a bit of weight just from her laser exercise. Nicely done hub. I like it very much. Nice hub I ever visit. OMgosh that poor kitty, but very cute :) My cats have both wet and dry and run around a lot, but are starting to put on weight! I think I really need to look at size of portions.They are both rescues and I think they think about food far too often. Thanks so much for the really helpful info. Excellent information. thank you! We have had several fat cats over the years and it is difficult, but possible, to help them lose weight. Our cat, Trouble, ate so much when we first rescued him that he was bullimic....but with lots of love and less food, he turned out to be a normal, healthy cat. Your hub is very good. Thank you!! This fat cat looks very cute. Sorry to hear that fat cat can suffer from diabetes. My God. That picture at the top is very cute, and quite chubby! I often call my cat a fat cat, but I feel I owe him an apology now, hehe. Nice hub. I like how you emphasized the need for real, carb-free food. My cats are both raw-fed, but I tend to feed them a bit too much and they're both kind of porky. Great picture! Just what I was looking for. Thanks so much and good luck with your Hubpage. Nice hub the cat is so cute. I thought my cat CIA was fat, but after seeing this photo I am not so sure. :) Very informative article. I have two cats who eat the same thing, and one is large and the other small. They are getting older and I am starting to phase out the dry food because of their teeth. You offer some excellent advice. My cat is obessed as well, I'll definitely try some of these advices. Thanks! When I had a cat with an ex of mine we had this long pole with a little toy on the end that we would have our cat chase and she could do it forever! Meyer, I always see the commercials for Emery Cat, and it looks like it works so well! Thanks for the review! LOL! What a cute cat! On another note, have you tried the Emery Cat claw trimmer? It helps your cat stay active (and drop pounds too). I wrote a review at http://nomorekittyclaws.com if anyone is interested. It is so cute! but it is also true that no matter it is humans or animals.. obesity is a curse for all .. Thanks for the additional tips, everyone! My mom's cat gets the dandruff you're talking about, CDiMartino... I know it's because he's too fat to reach and groom himself! You should be able to feel your cat's ribcage--if it's too covered in fat to feel, it's likely overweight. Also, the "dandruff" often seen on cat fur is an indication of obesity. Simply by slightly reducing the amount of food you put out each day will help. Also, scheduling a half-hour of active playtime (a feather wand, little rubber balls to chase and other fun activities) helps to burn the calories faster, and they'll love the attention. You can get cat diet food! Cool! If there's a nasty comment on this hub, it's probably from my 'fat' cat!!! Good info, thanks. I hadn't thought that dry food could be the problem with one of my cats who is a hefty boy. My cats aren't fat but I loved the photo. Reminds me of the "Built for Comfort, not speed" poster. Your cat looks like one of my "boys". I got 4 of them. How did you get a picture of my cat? He is the spitting image of the one in the photo. I have tried everything to get his weight down, I am just hoping Winter will help as he will be more active. Do fat cats live better lives? Love that picture! Thanks for the info, I have indoor cats, and weight is always an issue. First, check with your vet to see if your cat should be put on a special food, if not you may just want to monitor better what your cat eats. Make sure that all members of the household are on board about the cats diet so they are not feeding Little Fluffy table scraps. Treats should not make up more than 10% of your cat's total calories. Lastly, Cats are like people they gain weight when they do not exercise. It is essential that your cat has space and things that he can exercise on. Yo9u want your cat to leap stretch and run. If your home has stairs this is great exercise for your cat. If your cat doesn't get this exercise on their own I suggest you play with your cat using toy and items that will entice them to be active. Proper diet and exercise is essential in keeping your cat healthy and reducing their weight gain. 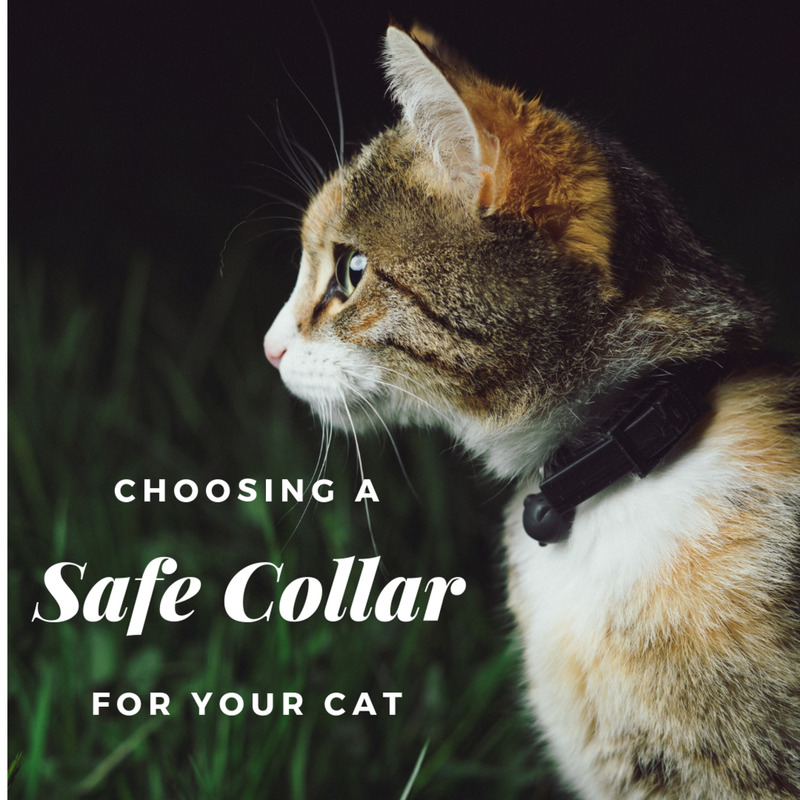 Great article...its something that many owners and cats could benefit from. We have one fat cat and one normal sized cat. Both are indoors. Sally's Trove has given me an idea of how to handle the amount we should offer them. We started picking up the dry food at night, but have been leaving it down during the day. Guess I will try offering the amount she suggests and then pick it up so neither one can eat any more than what is offered twice daily. If you have any other ideas......besides playing more with the fat cat........please let me know. And thanks for bringing up this subject. I'm so sorry about your kitty! My mom, who works at a vet, always yells about keeping the kitties away from the ribbon because she sees what happened to you all the time. When my kitties were eating different foods, I had to keep them separated! It was terrible, but it had to be done. Maybe if your fat cat is too fat to jump or go into a certain space, you can put your thin cat's food somewhere he can't reach... though that might be difficult. I had two fat cats and last spring one of them, Simba, had to have an operation to have a huge clump of years old Christmas ribbon removed from his tummy. He had lost half his weight so now I have a thin cat and a fat cat. I was told to leave hard food out for the thinny so he can beef up. How do I keep that away from the fatty? PS Simba is not allowed to wrap presents anymore. there is this one cat that i love!his name is pirate because he has one eye! i still love him because he strokes next to me all the time and purrrrrs!